Tomatillo salsa. Big, fresh, vibrant flavours. It’s instant delicious and it’s easy to make at home. 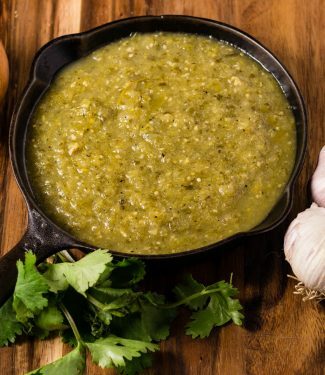 I love tomatillo salsa or salsa verde in roasted dishes and braises. It’s an instant fix. Need some Mexican inspiration. Tomatillo salsa to the rescue. Roasted chicken, pan fried pork chops, nachos, green pork chili. 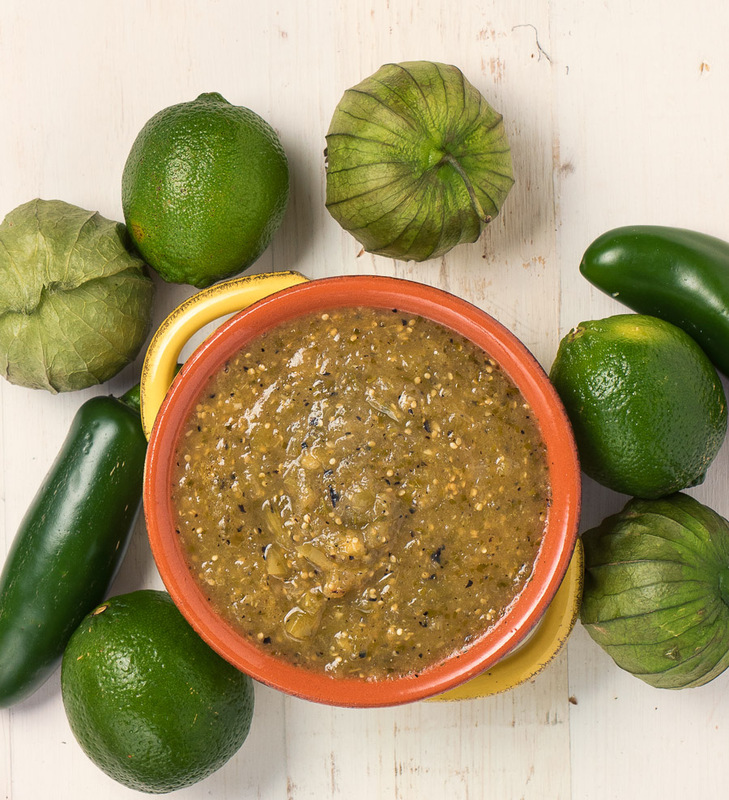 Everything is better with tomatillo salsa. Might be more powerful than bacon. I know that’s a bold statement but it’s really, really good. This tomatillo salsa recipe is more than just something to dip tortilla chips in. You can pretty much use salsa from a jar for that. Salsa is Spanish for sauce. Think of it that way. This is a foundation for more complex dishes. Season a chicken with some Mexican or cajun seasoning. Roast it off. Use the it to deglaze your pan. Thin it with a little stock. The flavours of the chicken blend into the salsa to make a fantastic sauce. Do the same thing with some pork shoulder. Or brown some pork stew and add a couple cups of it to braise. Make enchilada sauce. It all works. Magic stuff really. You can make this as a dip as well. No reason not to. It’s easier than the foundation sauce. Don’t roast the onions, garlic and jalapeño. That’s it. Keeps the flavours fresher. Less earthy. Clean. Tomatillo salsa. Salsa verde. Tomatillo jalapeño sauce. Just damn good. Use it. Love it. 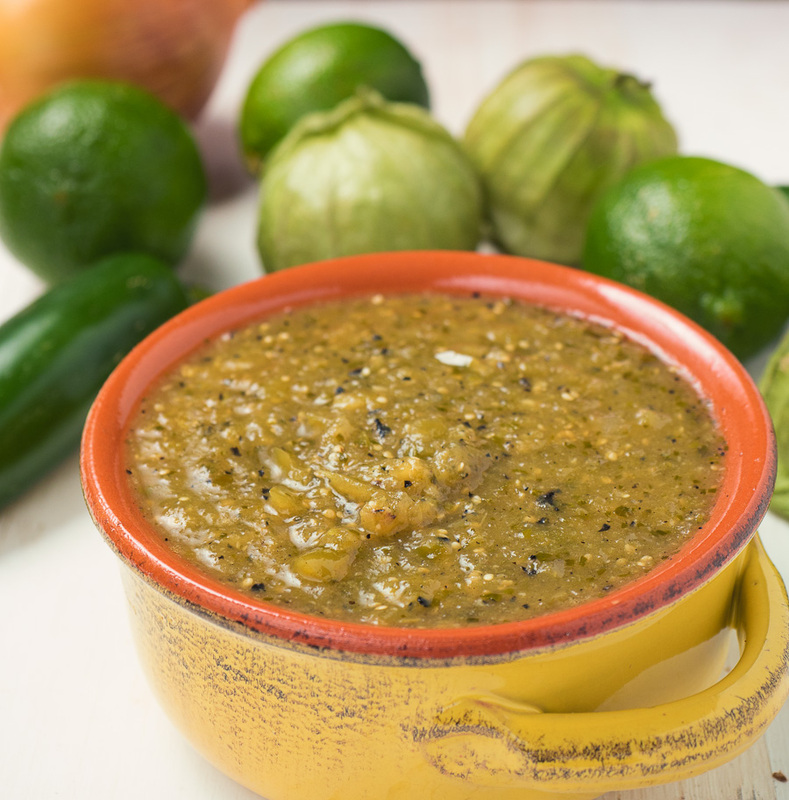 Try this tomatillo salsa as a sauce for roasted pork or chicken. Mix it into a green pork chili. There's all kinds of places you can use it. Just keep in mind if you want one for chips and salsa don't bother roasting the onions, jalepenos and garlic. Dry roast onions, jalepenos and garlic cloves in the comal until lightly charred. If you don't want your salsa too hot, scrape out the ribs and seeds after roasting the jalepenos. Bring a pot of well salted water to boil. Remove husks and cook tomatillos until they turn pale - around 4 minutes. Combine all ingredients except oil and chicken or vegetable stock in a blender or food processor and puree. Add pureed salsa to the pan and fry over medium high heat for 3-4 minutes.It will spatter when you add the salsa so be ready.